The Vagabond Glovers' Meanderings: Puffins! Today is our long awaited trip out to Machias Seal Island to see a large colony of nesting puffins. We are relieved that the day dawns clear and warm with just a little breeze—this bodes well for a smooth trip fifteen miles or so out into the open ocean. We have to be at the town dock at 6:30 a.m., but getting breakfast before we go is no problem—the same little quick stop restaurant where we got our exceptionally tasty pizza last night starts serving breakfast at 4 a.m., because Jonesport (population 1,100) is a town of folk who make a living from the local waters, and they start their days early (like the captain of our Lucky Catch cruise who ran 100 traps in the morning before he started his day job). The captain of Chief, the boat that takes us to see the puffins, waves at a lobsterman working traps a few miles out, and tells us it is his father. His 84 year old grandfather goes out to haul traps everyday, too, he says. A poster we have seen all over town advertises a big raffle, and the main prize is ten two-bedroom lobster traps. This is a serious lobstering town, without a single restaurant advertising lobster dinners—we have left the tourist towns behind. Our first sight of Machias Seal Island is the light, which is visible blinking to welcome us from several miles away. By the time I can see it, I am really looking forward to being on land again, even though the ocean is calmer than all but one day we have ever cruised in open Atlantic waters before. I am just a little out of practice, I guess. The island is claimed by both Maine and Canada. 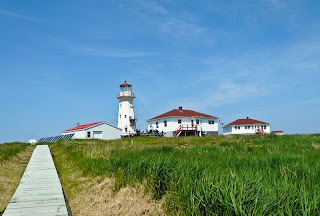 Canada built the lighthouse, and the Canadian Coast Guard staffs it, their costs covered by the Canadian Department of Foreign Affairs who is interested in maintaining keepers on the island "for sovereignty purposes." There is really no other purpose to be served by the keepers, since the light is fully automated now. A warden also lives on the island to protect the birds from excessive human interference. All of the positions—two lighthouse keepers and the warden---are double staffed, with each staffer serving 28 days on and 28 days off. Our tour manager sent strawberry shortcake out to the island with our boat, so we could deliver it to the island staff. Our guide says that they really appreciate fresh food, since they bring their provisions in with them when they change shifts, and most of their food is canned and frozen. Saving the best for last, yes, we see puffins. We take over 700 pictures of puffins and their kindred razorbills today, from the boat and from a blind, where we are left to snap away for one glorious hour. The blind has small wooden shutters we can raise on all four sides. 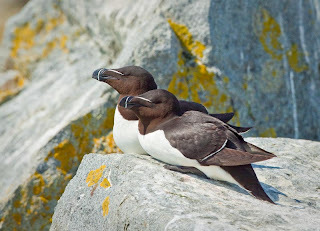 Outside, on the rocks just inches away from us are puffins and razorbills galore, preening, flying, socializing, and seemingly posing for our viewing pleasure. They are talking to each other with sort of a squeaky whooping noise. We can hear them scrabbling about on the roof of the blind, as well. The puffins look comical, the razorbills quite elegant. We can't get enough of their antics, and the hour goes quickly. Then we are back on the boat for the return trip, smoother than our trip out. As we leave, the water all around us is full of floating puffins, which our guide says can dive up to 120 feet and come back to the surface with up to 18 little fish in their bills. He also tells us that, crowded with birds as we thought the rocks were, because today is so warm (75 degrees), many of the puffins are staying out in the water where it is cooler, preferring not to hang out on the hot rocks. There are more puffins on the rocks when it is overcast and cold. 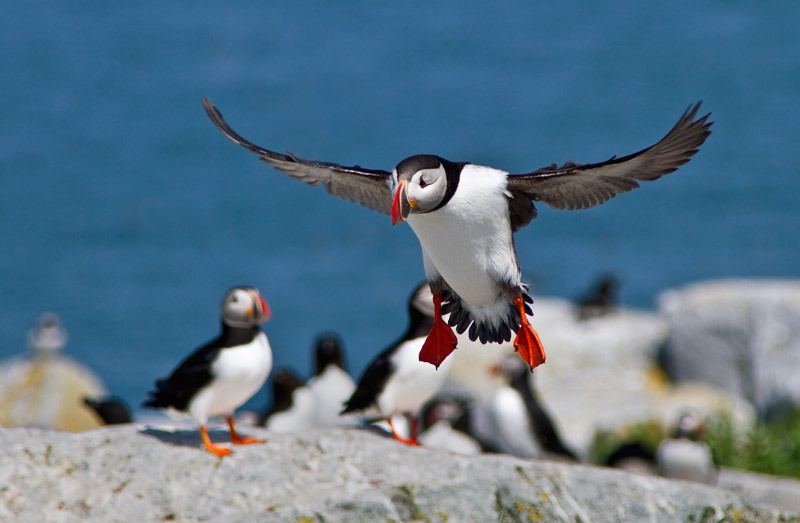 Of course, there's a trade-off there—the trip out and back and the hour in the dark blind are bound to be far more uncomfortable for the bird watchers on days that the puffins prefer. In fact, there is probably a direct inverse correlation between puffin comfort and human comfort. 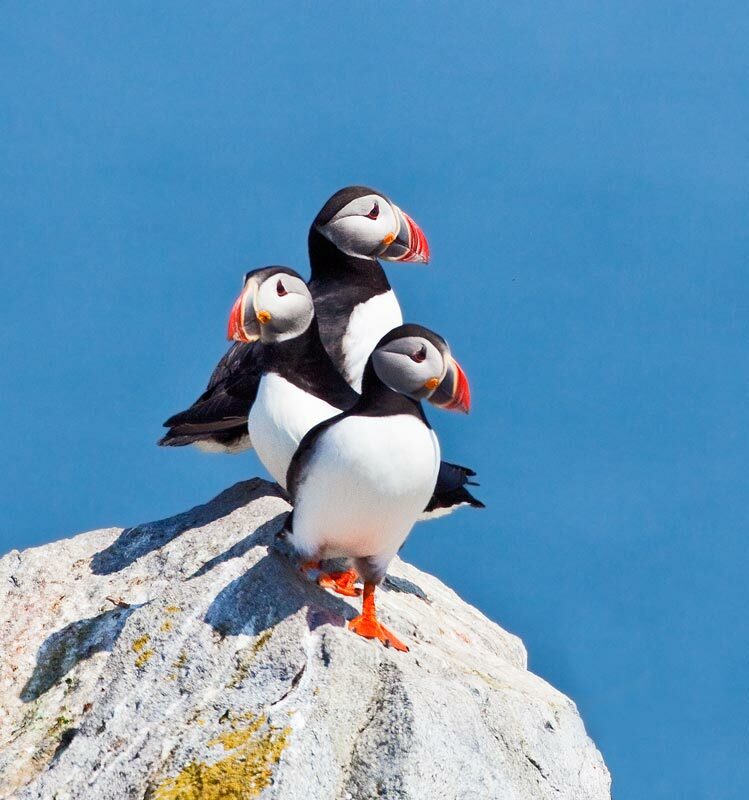 For us, the puffins on Machias Seal Island not only exceeded our expectations, they exceeded our imaginations. We can't imagine how this could be a better day. I'm glad today so wonderful.......I know it was much anticipated! The puffin pictures are great.